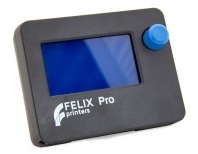 FELIXprinters | How to print flexible filament. 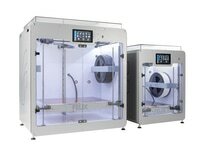 Our 3d printers can in general handle flexible filaments. Depending on the amount of flexibility, you might need to take some extra precautions to print it well. These are general tips which should work. Make sure there is no obstruction present. It is essential that the filament does not experience any obstructions in the hot-end barrel, before reaching the hot parts of the hot-end. Otherwise chances of buckling filament inside the extruder are very high. Obstructions can occur if there has been printed with some hard filament before, make sure it is removed from the barrel of the hot-end. This can be done by extruding some hard filament and then fully retract it again. Easy way is to do it via the display unit. Then slowly extrude the filaflex into the hot-end. Cut the end of the filament in a skew manner. The extruder gears might find it difficult to get grip onto the fist part of the flexible filament which is fed into the extruder. Adjust the clamping range of the filament arm. Please read for more information in this article. Lower the print speed settings in slicer. To begin with slice the object with lowest speed settings. Lower the overall print speed. Via the display unit take the following steps. main menu -> quick settings -> choose feedrate and lower it to 50% to begin with. You can increase the speed gradually to find the the best option.